“eStore Builder”, found at estorebuilder.com, is link posting scam site that is a redirect from Automated Paydays, by Jamie Shaw, a fictional character made to portray a single working mother. Automated Paydays has been reviewed elsewhere on ScamXposer. By now you might get a hint that all is not well, but I’ll make certain you know for sure by the end of this review. eStore Builder is there for no purpose other than getting you to sign up and give up your personal information along with your credit card so they can siphon as much of your money as they can. The scammers who operate eStore Builder have their racket down to a science, which I’ll get into in a moment. If you read the disclaimers you will see that the represented news organizations have absolutely nothing to do with ‘eStore Builder’. There are a few more disturbing issues in the disclaimer too, so be sure to read it thoroughly. The fake mom, “Jamie Shaw” from “Automated Paydays”, does not exist any where online outside of this scam. Just try searching for her. eStore Builder uses the same ploy as all the other scam sites but they just change the name of the work from home mom every time. eStore Builder also uses the same trick of limited spots available to create a sense of urgency in you to sign up. There’s no such thing. Opting in will takes you to the page with all the fake testimonials and fake news clip. All the photos are stock pictures taken from a stock photo site. You can go to the photo sites and find the same photos. Even Jamie Shaw’s photo is a stock picture. eStore Builder is not a job but a very risky” work from home opportunity” through posting advertisement links, which involves time, effort and more investment. 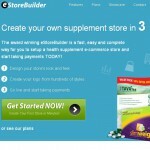 Usually you don’t make a huge amount of money doing this, contrary to what eStore Builder claims. The ads you would be posting are for an MLM company called Shaklee, for the express purpose of building a downline. This means you would have to be a part of this business, which we have also reviewed on our site elsewhere as a not recommended business. Be aware that eStore Builder uses the made up job titles like Search Engine Agent Program and Wealth Development Center. It’s a smoke and mirrors to make you think there’s some sort of certification that would make you more money but that is just not so. The worst thing about scams like eStore Builder is that they actually have their aggressive salespeople call you for useless business coaching programs that do nothing for you but drain you bank account. Steer very clear of this atrocious scam, eStore Builder, and you will be a lot happier, believe me. I do not recommend “eStore Builder”.